Tesla is supposed to deliver 400,000 vehicles by 2018. Yet workers have never pushed annual production beyond 100,000.In 2016, Musk bought Grohmann Engineering, a German automation specialist. 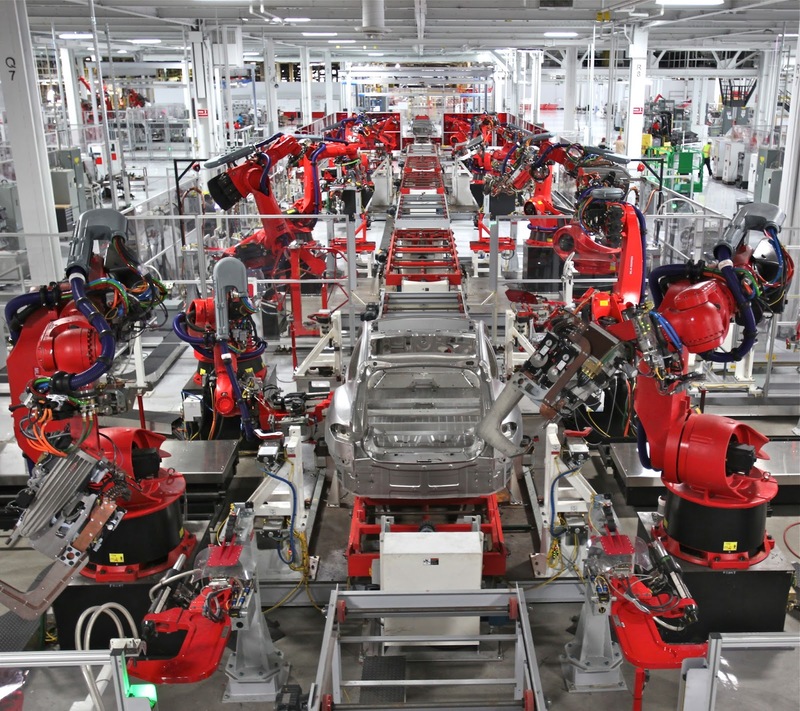 With 580 giant, robotic arms, current Tesla factories are already state-of-the-art. The Fremont, Calif., plant has seen a 400% increase in production since 2012. Version 3.0 could improve production by five- to ten-times. Elon Musk is obsessed with speed. From rockets to hyperloops to electric cars, fast is kind of his thing. Now he wants to apply the same aesthetic to manufacturing. Critics argue it’s another pipe dream, born out of necessity. Tesla, his controversial car business, is supposed to deliver 400,000 vehicles by 2018. Yet, his workers have never pushed annual production beyond 100,000. Musk, however, is thinking beyond workers. The future is total automation. More than 100 years ago, the assembly line transformed industrial production. Our current age is all about information technology -- intelligent software, sensors and incredibly precise, fast-moving robotics. These technologies promise exponential improvement in production. Humans, at least those who fasten bolts or shift metal, become superfluous. It’s not science fiction. Musk already has big plans for factories that are unencumbered by the physical limitations of humans. In Tesla’s July 2016 mission statement, he wrote about his epiphany: Turning the factory into a machine. He even gave it a cool name, the “alien dreadnought” the machine that makes the machines. By his math, dreadnought version 3.0 could improve production by five- to ten-times. That’s still a few years away. Version 0.5 will debut in 2017, when the Tesla Model 3 begins production. Expect version 1.0 during 2018 when new equipment hits the factory floors. In 2016, Musk secured a secret weapon to help him bring these futuristic factories closer to the present. Tesla bought Grohmann Engineering, a German automation specialist. 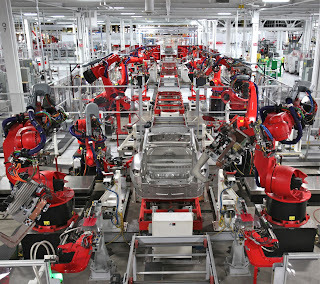 With 580 giant, robotic arms, current Tesla factories are already state-of-the-art. They push human limits. The Fremont, Calif., plant has seen a 400% increase in production since 2012. And workers -- the human kind -- have complained often about the frantic pace. Dreadnought will supersede their frailties. In fact, robots will move so quickly and so efficiently that humans won’t be safe on the factory floors. So, just a skeleton staff of engineers will be on hand — and they will merely monitor production. This would represent the first major advance in automobile manufacturing since Toyota introduced Just-in-Time in 1992. The premise is to produce cars on an as-needed basis, with minimum waste and maximum automation. It’s the promise of our current age. Most outcomes can be predetermined with access to computing power, data analytics and modeling software. Robotics-makers can build exactly what they need — and control it with incredibly sophisticated software. A new industrial revolution is coming. And it will lead to unimagined profitability, and huge new opportunities for investors. Dreadnought is the first step. Eliminating most humans, at least in theory, would improve production by orders of magnitude. Engineering would be the sole arbiter of production. Raw materials would enter factories at one end. Finished cars would emerge from the other end. It’s easy to want to bet against Musk. Automobile factory floors are already full of complex machines. The Robotics Industries Association estimates that 265,000 robots already work in U.S. factories. The consensus holds that all the potential efficiencies have been exploited. However, Musk is ambitious, and talented. He is also in a hurry to get places. He came up with a feasible plan for Hyperloop — a way to whisk passengers though a vacuum tube at 760 mph. His rocket company can deliver satellites to orbit, then return to Earth with pinpoint accuracy. His electric cars are safe, green and can blow away a Lamborghini. He is used to doing what most people consider impossible. If he can pull off the alien dreadnought, the face of manufacturing will change forever. It’s a big deal. Make sure you're ready.